or buy these books online. 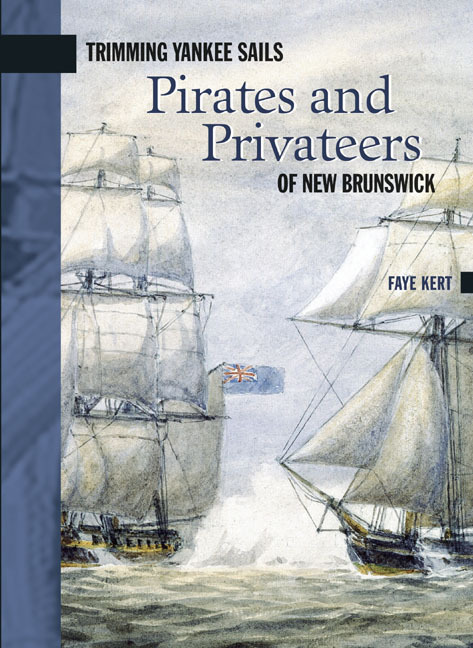 From privateers to peacekeepers, from sailing ship battles to submarine espionage, New Brunswick�s recorded naval history dates back to the first European incursions. Bounded on three sides by the ocean and with a network of navigable rivers, the sea has dominated the province�s history. The battles between the English and the French led to seaborne invasion and the Expulsion of the Acadians. When the Americans and British plundered each other for patriotism and profit in the War of 1812, New Brunswick built its own navy to protect its shipping. In 1881, the new Dominion of Canada chose New Brunswick as its first naval base, and three decades later, MP George Foster initiated the parliamentary debate that led to the founding of the modern Canadian Navy. 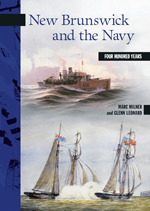 This fact-filled volume tells the story of the province�s unique contribution to Canada�s storied naval history, culminating with a description of how, by the Naval Centennial year of 2010, the bulk of the modern Canadian fleet was designed and constructed in New Brunswick. Marc Milner is one of Canada�s premier naval historians. He is the author of eight books, including Canada�s Navy: The First Century. He is also the Director of the Brigadier Milton F. Gregg, VC, Centre for the Study of War and Society at the University of New Brunswick. Glenn Leonard is an Assistant Professor in the Faculty of Business Administration at the University of New Brunswick. New Brunswick and the Navy War is volume 16 in the New Brunswick Military Heritage Series. �I cannot tell you how glad I am to be able to go to the front, for it means a chance to do good work and I shall be so glad to be nearer the Canadian boys.� � Agnes Warner. When Canada entered the Great War in 1914, thousands of women eager to see active service signed on to nurse the wounded. What they experienced in the hospitals behind the front lines would remain with them forever. Through thunderous explosions and ominous flashes in the distance, nursing sisters worked at a feverish pace to care for bleeding wounds, broken and missing limbs, and the other devastating injuries of war. In Agnes Warner and the Nursing Sisters of the Great War, Shawna Quinn explores the world of these brave women � the gruelling, dangerous conditions of work and the brutal realities they faced. Drawing upon the letters of Saint John native Agnes Wagner, Quinn paints a picture of the dedicated women who witnessed firsthand the atrocities of war. Shawna Quinn holds an MA in history from the University of New Brunswick. She first came across the story of First World War nurse Agnes Warner while researching the role of women collectors in the development of the New Brunswick Museum. 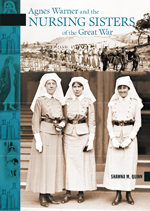 Agnes Warner and the Nursing Sisters of the Great War is volume 15 in the New Brunswick Military Heritage Series. 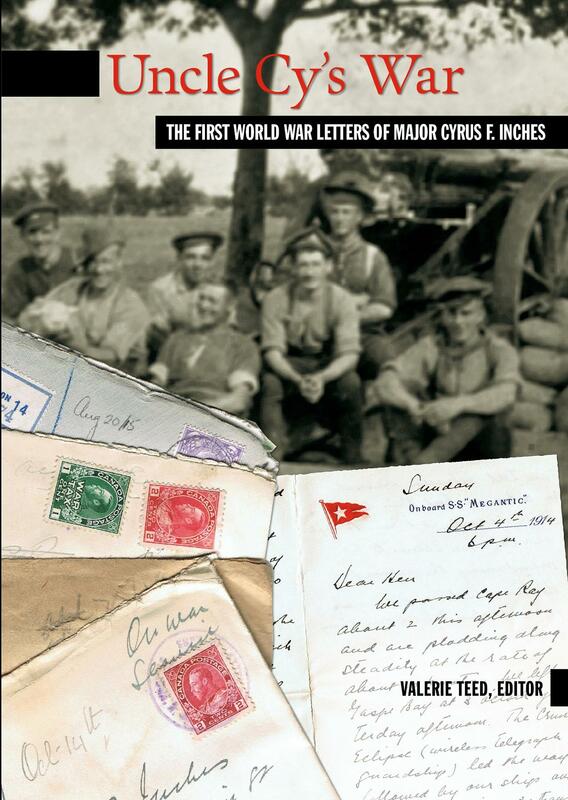 At 31 years old, Major Cyrus Inches resolved to survive the Great War, and did so without losing his sense of humour, in spite of the tragedies he constantly faced. His letters home were stored and left undisturbed for almost ninety years. Cleverly written with wit and humour, they reveal voluminous details of life during the war. Cyrus Inches also kept a diary and published a booklet called The 1st Canadian Heavy Battery in France — Farewell Message to NCOs and Men, which chronicled the movements and the battles of his battery. The booklet and letters combine to create a complete history of one Canadian officer's experiences — from Valcartier and the First Battle of Ypres to Mons, and the months of demobilization after that. Uncle Cy's War is Volume 14 in the New Brunswick Military Heritage Series. 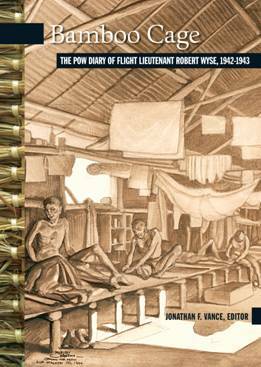 In 1942, RAF Flight Lieutenant Robert Wyse became a Japanese prisoner of war on the Indonesian island of Java. In this no-holds-barred account, Wyse describes the harsh conditions he and his fellow prisoners suffered. Subjected to beatings, starvation, debilitating illness, and unbelievably harsh work, Wyse struggled to describe the brutalities he witnessed. Although the punishment for keeping a diary would have been severe, Wyse persevered, scrounging for bits of paper and slivers of pencil and hiding his writing wherever he could until it became too dangerous to continue. Then, in December 1943, he buried his notes in a piece of bamboo under his prison hut. Robert Wyse’s diary was retrieved by a Dutch friend after the war. An historical goldmine of information on life as a prisoner of war, the diary reveals both the worst and the best of human nature. The editor, JONATHAN F. VANCE, is a professor of History and the Canada Research Chair in Conflict and Culture at the University of Western Ontario. His previous books include Unlikely Soldiers: How Two Canadians Fought the Secret War Against Nazi Occupation and The Encyclopedia of Prisoners of War and Internment. Bamboo Cage is volume 13 in the New Brunswick Military Heritage Series. Imagine you're a young woman caught up in the ugly reality of war. You meet and fall in love with a young soldier from a foreign country. You marry and your world is upended: when the war ends, you leave all you've ever known behind - your family, friends, and way of life - to begin a new life in Canada. This is the story of hundreds of women who made their way to New Brunswick at the end of the Second World War. Between 1942 and 1948, young women from all over Europe came to this part of Canada with their servicemen husbands. Some married Aboriginal New Brunswickers; others married French-speaking Acadians; still others married New Brunswickers of British descent. In this compelling volume, wives, widows, fiancées, and those whose marriages failed and returned to Europe tell compelling stories of prejudice, perseverance, kindness, hope, defeat, and triumph. Captured Hearts is Volume 12 in the New Brunswick Military Heritage Series. Picture this: Canadian troops die by the thousands in the muddy fields of Europe. Russia is descending into civil war, and will soon be lost to the Allies. The French army has mutinied. The United States has declared war on Germany, but their army nees time to prepare. German U-boats are turning the seas into floating graveyards. Back in Canada, fewer and fewer men are volunteering to join the fray. Prime Minister Borden's government proposed conscription to replace the dead and wounded. Farmers, fishermen, francophones, and the Liberal Party opposed the Military Service Act. Canada was in upheaval. Many reduced the issue to tension between pro-British Onatrio and anti-war Quebec, but there was more. In New Brunswick, ruptures emerged, north and south, Protestant and Catholic, and French and English. The Legacy ofbitterness and ethnic tensions echo to this day. Harry L. Gill enlisted in the Royal Canadian Air Force in 1940 at the age of 18. He flew a Hurricane fighter on missions over France, England, and India and was awarded the Distinguished Flying Medal before being shot down near Burma in 1943. Hurricane Pilot recreates the heady days of flight and fellowship through Gill's own correspondence with his parents and siblings. Depicting the enthusiasm of youth, a sense of humour, his plans for the future, and an attachement to home, this very personal account of war shows how Gill was transformed from a small-town boy to a mature fighter pilot serving in a global war on another continent. On the morning of July 4, 1944, the 1st Battalion of the North Shore Regiment moved into position just west of the French village of Carpiquet, its ranks filled with farmers, fishermen, woods workers, and mill hands. Most of the men had been in the first wave that stormed the Normandy beaches a month earlier and were already battle-hardened veterans, but nothing could have prepared them for what was to come. In five long days, Carpiquet became the graveyard of the Regiment. Almost 200 men were killed or wounded, and the fighting strength of the Battalion's rifle companies was gutted. D-Day to Carpiquet tells the story of the D-Day landing and the ferocious battles that followed. Using extensive new research and interviews with veterans, this unique account reveals the significance of the Regiment's accomplishments in the first stage of the Normandy campaign. In the early 1860s, Irish immigrants in the United States were eager to help the Fenian Brotherhood overthrow the British in Ireland. The American Fenians' mission: to invade British North America and hold it hostage. New Brunswick, with its large Irish population and undefended frontier, was a perfect target. The book tells how, in the spring of 1866, a thousand Fenians massed along the St. Croix River and spread terror among New Brunswickers. When the lieutenant-governor called in British soldiers and a squadron of warships, the Fenians saw that New Brunswick was no longer an easy target, and they turned their efforts against central Canada. The Fenian "attacks" and the demand for home defence fanned the already red-hot political debate, and a year later, in July 1867, New Brunswick joined Confederation. Turning Back the Fenian is volume 8 in the New Brunswick Military Heritage Series. 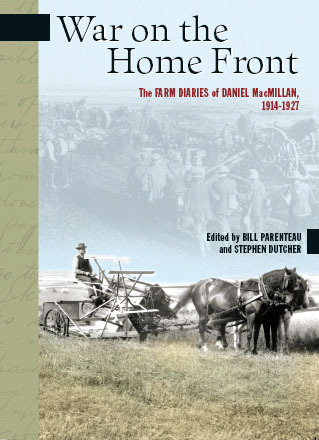 Daniel MacMillan experienced the Great War entirely from the home front: his farm in the tiny community of Williamsburg. His moving diaries reveal the terrible cost of the war and its aftermath on him, his family, his farm, and his community. In entries written between 1914 and 1927, MacMillan describes the hardships of running a farm in the face of an acute labour shortage and the anguish of losing relatives and friends in battle. His insider’s account shows rural people struggling to supply men, equipment, and especially food — not just for the troops, but for the whole country — and the post-war results of such sacrifice. Pirates and privateers sailed from New Brunswick ports throughout the 19th century, but their exploits began in earnest during the War of 1812. With Letters of Marque and Reprisal, they waged a legal private war against the King’s enemies: the Americans. The European states outlawed privateering in 1856, but the American failure to sign the treaty left an opening for a gang of ne’er-do-well Saint Johners, led by a renegad xe Southern rebel, to commit one of the final acts of piracy in North American history. In December 1863, on behalf of the Confederate States of America, they captured the SS Chesapeake, the New York-to-Portland passenger steamer. The Trans-Canada Highway winds along the Saint John and Madawaska rivers through New Brunswick and Quebec to the St. Lawrence River. 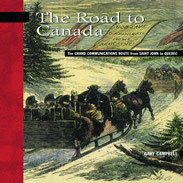 It follows one of the oldest and, strategically, most important routes in North American history: the Grand Communications Route. For millennia, the Saint John River system had been a major artery in the vast system of lakes, rivers, and portages linking aboriginal communities. During the French and British colonial periods, and until the advent of rail travel in the 1870s, it remained the backbone of an overland route between the Atlantic Ocean and the interior of the continent. Today, the traveller along the Trans-Canada Highway can visit some of the forts that once defended this vital Road to Canada. The British capture of Fort Beauséjour was the final act in a long struggle between Britain and France for control of Acadia. In The Siege of Fort Beauséjour, 1755, Chris M. Hand outlines the events leading up to the siege and gives a running account of the seige itself. In June, 1755, a combined force of New England volunteers and British regulars captured it after a brief siege. When Beauséjour fell, so too did Acadia, and the great expulsions followed soon after. Major Chris M. Hand, Royal Canadian Regiment, is currently serving overseas, seconded to the British Army, Warminster, England. The Siege of Fort Beauséjour, 1755 is based on his MA thesis in history at the University of New Brunswick. The Siege of Fort Beauséjour, 1755 is Volume 3 in the New Brunswick Military Heritage Series. Published in cooperation with the Military and Strategic Studies Program at the University of New Brunswick and the Canadian War Museum, this series is part of the New Brunswick Military Heritage Project. Knowing how to handle horses was Jimmie Johnston’s lucky break. As a horse driver in the transport section of the Canadian machine gun corps, the 18-year-old from rural New Brunswick experienced Vimy Ridge and Passchendaele from a saddle rather than from behind a rifle. Even so, moving machine guns, ammunition, and supplies to the front lines was treacherous work; what the horses and mules suffered, Johnston says, “is beyond all description.” The transport teams frequently operated under the cover of night. If a team fell into a shell hole, both man and horse faced drowning in the filthy mud, and climbing out of a trench was even riskier. Riding into War is volume 4 in the New Brunswick Military Heritage Series, and was edited by Brent Wilson. In April, 1775, the first shots of the American Revolutionary War were fired; almost immediately, reverberations were felt in what is now New Brunswick. In this concise history of the Revolution’s impact, Robert L. Dallison examines the legacy of the Loyalist regiments, who settled here to defend the British colony against the American Patriots. Their motto, Spem reduxit (Hope Restored), has become the motto of the province they founded. As well as telling the story of the military Loyalists, Hope Restored describes many Loyalist and Revolutionary War sites. After serving for 35 years with the Canadian Army, Lieutenant-Colonel Robert L. Dallison (ret’d) became the director of Kings Landing Historical Settlement at Prince William, New Brunswick. A graduate of Royal Roads Military College and Royal Military College, he has been president of Fredericton Heritage Trust and a member of the Heritage Canada board of governors. Saint John, always an important gateway to Canada, is one of the oldest fortified sites in the country. Saint John Fortifications, 1630-1956 traces the history of the port’s defences, from Fort La Tour, built in 1632, to the 20th-century installations built as protection from German invasion. Although the last of the modern installations on Partridge Island was disabled in 1956, many sites still contain substantial reminders of their past strength. Roger Sarty, one of Canada’s foremost military historians, is the deputy director of the Canadian War Museum and the author of Canada and the Battle of the Atlantic. Ottawa military historian Doug Knight is a retired Canadian Army officer. His engineering experience provides a solid background for his research into the history of Canadian military equipment and fortifications.